"... the book has given me a wealth of good, fresh ideas about every facet of the architecture process ... makes a substantive contribution to the body of IS planning knowledge." let data determine the sequence for implementing applications systems. 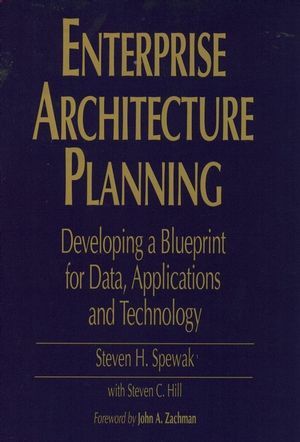 Here the authors give you a common-sense approach to Enterprise Architecture Planning. You'll find dozens of examples of architectures, procedures, checklists, and useful guidelines to support these techniques. This is the best guide available to help you ensure a cost-effective, long-term solution. Steven H. Spewak, Ph.D., and Steven C. Hill Industry veteran Steven H. Spewak, Ph.D., is Chief Architect for DHL Systems Inc. Steve Hill is a Product Manager for Logic Works in Princeton, NJ. They can be reached on CompuServe at 71521,1052 and 70262,1135, respectively. Current Systems and Technology Architecture.